Frightened Boy Scouts huddled in a shelter as a tornado tore through their western Iowa campground, killing four people and injuring 48 others who had little to no warning of the approaching twister. At a press conference Thursday morning, officials released the name of the four teenagers who died. Three of them, Josh Fennen, 13; Sam Thomsen, 13; and Ben Petrzilka, 14, were from Omaha, Neb. The fourth, Aaron Eilerts, 14, was from Eagle Grove, Iowa. Tornadoes also touched down in Kansas, Minnesota and Nebraska on Wednesday. They killed at least two people in northern Kansas, destroyed much of the small town of Chapman and caused extensive damage on the Kansas State University campus. In Iowa, rescue workers cut their way through downed branches and dug through debris amid rain and lightning Wednesday night to reach the camp where the 93 boys, ages 13 to 18, and 25 staff members were attending a week long leadership training camp. The boys were split into two groups when the storm hit the Little Sioux Scout Ranch in the remote Loess Hills. One group managed to take shelter, while the other was out hiking. At least 42 of the injured remained hospitalized Thursday morning, with everything from cuts and bruises to major head trauma, said Gene Meyer, Iowa's public safety commissioner. At least four of the injured had been airlifted from the camp, he said, refusing to elaborate on their conditions or identify the dead. "Our thoughts and prayers are with the victims and the families of the victims," Iowa Gov. Chet Culver said. "We continue to do everything we can to make sure those injured are going to recover." All the scouts and staff were accounted for, Meyer said, adding that searchers were making another pass through the grounds to make sure no one else was injured. The camp was destroyed. Thomas White, a scout supervisor, said he dug through the wreckage of a collapsed fireplace to reach victims in a building where many scouts sought shelter. "A bunch of us got together and started undoing the rubble from the fireplace and stuff and waiting for the first responders," White told KMTV in Omaha, Neb. "They were under the tables and stuff and on their knees, but they had no chance." The tornado struck at 6:35 p.m. White said he and other camp officials saw a funnel cloud forming and tried to sound a siren attached to the camp's administrative building, but it wasn't clear if they hit the alarm. The nearest tornado siren is in nearby Blencoe, but that siren sounded only briefly after the storm cut power to the town, said Russ Lawrenson of the Mondamin Fire Department. "The tornado came in pretty fast, ahead of the storm," he said. Taylor Willoughby, 13, of Bellevue, Neb., said several scouts were getting ready to watch a movie when someone screamed that there was a tornado. Everyone in the building hunkered down, he said, but windows were breaking. Willoughby said he saw another scout with his head split open. "It was a pretty gruesome image," he said. Willoughby was treated a Burgess Health Center in Onawa, Iowa, for a bruised back. The injured were also taken to Alegent Health Clinic in Missouri Valley, and Creighton University Medical Center in Omaha. Burgess spokeswoman Beth Frangedakis said 19 victims arrived at the hospital around 8:30 p.m. Their ages ranged from 2 months to 15 years, plus three adults. Frangedakis said four were admitted to the hospital, one was taken by helicopter to Mercy Medical Center in Sioux City, Iowa, and the others were released. She wouldn't release the nature of the victims' injuries. Gayle Jessen of Fremont, Neb., said her 19-year-old son Zach is a staff leader at the camp. He called his parents to say he had a bruise on an arm and was being treated at a hospital. "I'm so relieved my son is OK," Jessen said. She said her husband was headed to the hospital to pick up their son. David Hunt, chairman of the Mid-America Boy Scout Council's Goldenrod District, which covers several eastern Nebraska counties, said he believed the boys were from eastern Nebraska and western Iowa. The 1,800-acre ranch about 40 miles north of Omaha includes hiking trails through narrow valleys and over steep hills, a 15-acre lake and a rifle range. The tornado touched down as Iowa's eastern half grappled with flooding in several of its major cities. The storm threatened to stretch Iowa's emergency response teams even further. Iowa Homeland Security spokeswoman Julie Tack said officials were confident that the state's emergency response teams could handle the crisis because western Iowa had been largely unaffected by the recent flooding. Meanwhile, a line of tornadoes cut a diagonal swath across Kansas, causing widespread damage. Chapman, a Dickinson County town of about 1,400, appeared to be hardest hit. Sharon Watson, spokeswoman for the Kansas Adjutant General's Department, said more than 60 homes were destroyed and numerous buildings were damaged. All three of the town's schools were damaged, and the high school gymnasium lost part of its roof. "It went through the heart of the community," Brad Homman, director of administration and emergency services for Dickinson County, said of the tornado, which hit around 8:20 p.m.
Chapman said one victim was found in a yard in Chapman. Homman said three people were critically injured and taken to Geary Community Hospital in Junction City. Electricity was out across town, and Homman said the search continued for other possible victims. "We're still going through methodically one residence at a time," he said. The other Kansas victim was found outside a mobile home in the Jackson County town of Soldier, Chapman said. A tornado also hit the Kansas State University campus in Manhattan, damaging several buildings and tossing cars. The university said no injuries were reported. In Minnesota, a twister ripped a house from its foundation, leaving a bathtub protruding from a back wall near Fulda, 140 miles southwest of Minneapolis. A woman inside at the time suffered a knee injury. Another struck a farm near Springfield, Minn., causing extensive damage to outbuildings, but no injuries to people or livestock. 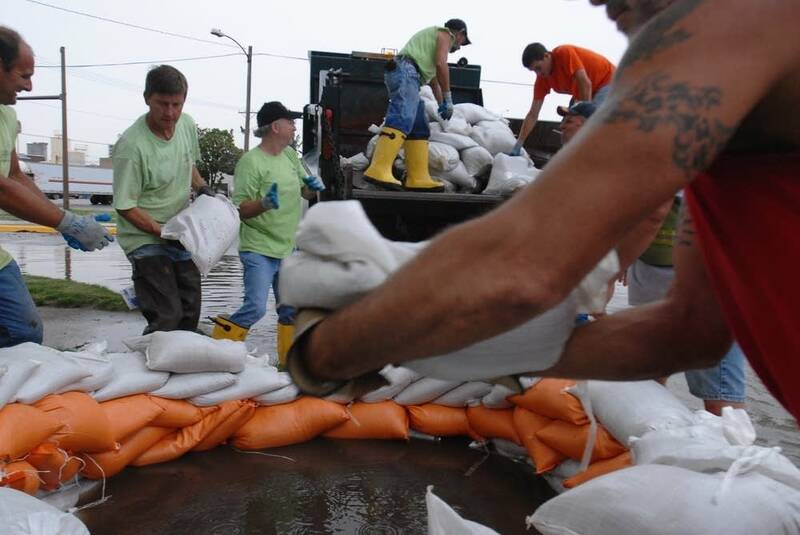 From Wisconsin to Missouri, officials in the storm-ravaged Midwest spent Wednesday fortifying levees with sandbags, watching weakened dams and rescuing residents from rising water. High water in Indiana burst a levee, flooding a vast stretch of farmland. In Minnesota and North Dakota, strong winds closed a highway and even sent a cow into the air, a witness said. Along the Mississippi River in Missouri and Illinois, the National Weather Service was predicting the worst flooding in 15 years. Outlying areas could be inundated, but most of the towns are protected by levees and many low-lying property owners were bought out after massive flooding in 1993, officials said. Associated Press writers Henry C. Jackson in Des Moines, Iowa; Anna Jo Bratton in Onawa, Iowa; and John Hanna in Chapman, Kan., contributed to this report.